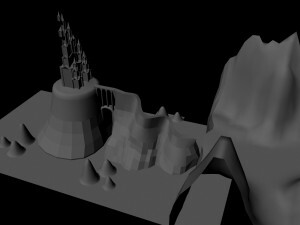 I’ve spent the first week modeling out the basic form for my mountain and castle. I made sure that every poly face was as equal as possible to avoid distortion. Now that all of that is done, I’m going to export each model piece as an OBJ, and bring it into Mudbox to start sculpting the fine detail.